Posted on February 03, '10 by Sarah Ward. Winter is ending and yet all I want to do is make cute, fuzzy hats. And yet I know that I need to start making some Spring-ish items. I have some ideas that I’m excited to work on…one I finish a couple other orders. Right now I’m working on a skirt for my neice’s birthday. It’ll be like my daughter’s but in blues. The hardest part for me is figuring out sizing and making the skirt fit the sizes my sister sent me. I hope to make some light scarfs and skirts and onsies for the Spring. Posted on December 08, '09 by Sarah Ward. It’s been quite awhile since I posted on here…what’s happened in the last year? Bought a house, had a kid, helped my husband record a CD. All good stuff. After selling some items at a craft fair this past weekend with a friend I feel re-motivated to pursue my craftiness. My first new design is very exciting. Posted on May 22, '08 by Sarah Ward. Here are some “works in progress.” I’m planning on putting something to the effect of “Change is good” on the chameleon onsie and “Who are you” on the owl. I’ve found that I like working on more than one onsie/shirt at a time. I feel more motivated and can get more done by doing more of an assembly line system. Posted on May 17, '08 by Sarah Ward. I have some great fabric that shimmers somewhat in the light. I’ve had a lot of fun making it into butterflies. I’m thinking about trying some little fish next for a more boyish design. Posted on April 19, '08 by Sarah Ward. I haven’t listed anything new in awhile or made any improvements on my site. Why? I’ve been busy with my new baby, Samuel, who was born at the end of March. It’s so hard to believe that it is now almost a month later. But I have a new butterfly design that I’m just getting inspired to put together. I made one shirt for my niece and will soon be listing a onsie version. Keep your eyes open for it. 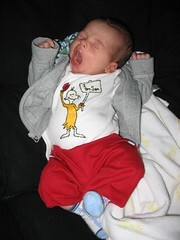 Here’s a quick picture of Samuel in his onsie I made. Posted on February 13, '08 by Sarah Ward. A lot of people ask me if I have somewhere they can look to see samples of my designs since I don’t usually have a lot of inventory on hand. I take pictures of everything I make and store them on my computer…no wonder it runs so slowly. :) I actually printed out a bunch of pictures for a craft fair I was involved in this past winter which is helpful. But the best way has been to create a “Sarah’s Creations” set on my Flikr page and send people a link to that. But I like my new website and would like to be able to send people to this so I spent time today uploading pictures of my past products into a “Photo Album” on this website (find the link on the right sidebar). 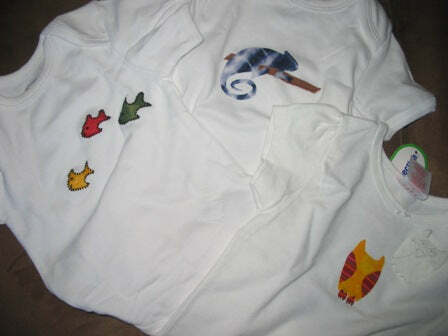 Check it out for ideas of the design you’d like for your next onsie or T-shirt. Posted on January 03, '08 by Sarah Ward. I’m back home from a two week Christmas vacation where I saw everyone in my family (11 people) and everyone in my husband’s family (6 people). It was a wonderful time and while there my brother-in-law helped me get this new shop up and running. So now my job is to personalize it and get my stuff listed so you can buy what you need. Posted on December 27, '07 by Sarah Ward. So, I’m trying out a new service called “Shopify” to setup the Little Knots store. We’ll see how it works!